More often than not, policymakers focus on school-based strategies to spur improvements in the educational progress of students. The 2002 No Child Left Behind Act, which demands greater school accountability for student performance, is a case in point. Yet, what happens in the classroom is only part of the story. 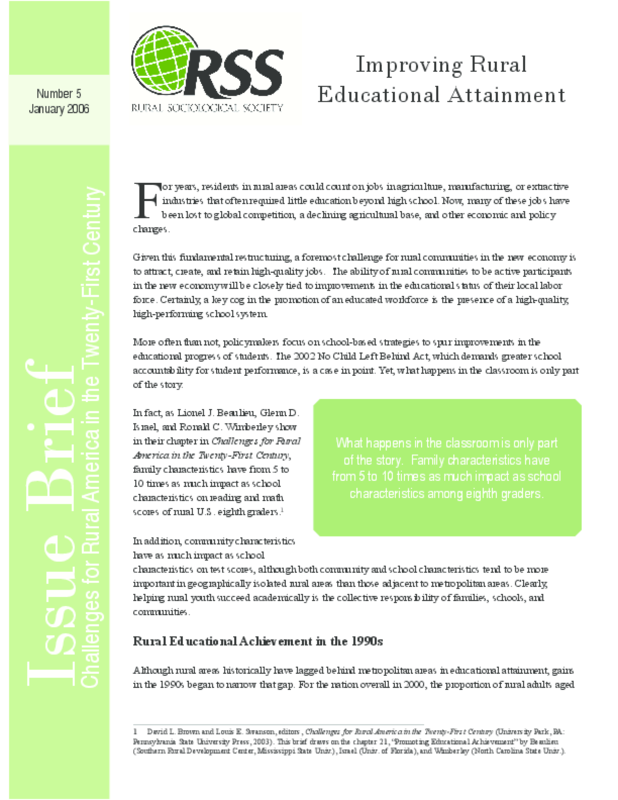 In fact, as Lionel J. Beaulieu, Glenn D. Israel and Ronald C. Wimberley show in their chapter in "Challenges for Rural America in the Twenty-First Century", family characteristics have from 5 to 10 times as much impact as school characteristics on reading and math scores of rural U.S. eighth graders. In addition, community characteristics have as much impact as school characteristics on test scores, although both community and chool characteristics tend to be more important in geographically isolated rural areas than those adjacent to metropolitan areas. Clearly, helping rural youth succeed academically is the collective responsibility of families, schools, and communities.